Being an entrepreneur might seem like an easy way to achieve success. But often it’s a rocky road you must navigate and steer your business in the right direction. There are many things that you will come across that require difficult decisions and cause stress. If you have a new startup on your hands and are looking for funding, you may ask, what is my company’s value? The answer to this question has a huge effect on the capital that you will be able to get for the business. Sadly, valuation is a very complicated thing. Due to this, a lot of startups tend to use convertible notes for their initial seed capital when engaging with investors. Known as a kind of funding for startups, convertible notes are short-term loans which convert into security as time passes. A lot of entrepreneurs usually use these kinds of financing instruments before they establish a value for their company. This helps them give the valuation of their company a needed kick-start. A bit confused? 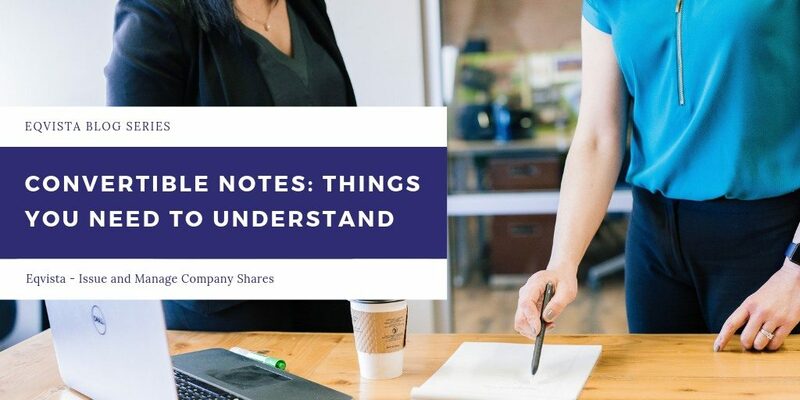 After you are done reading this, you would know exactly what a convertible note is, how they work and if they are the right thing for your company or not. A convertible note is a kind of funding instrument that converts into equity after a period of time. In short, it is a convertible security. But what is a convertible security? Well, these include many funding instruments expected to turn into stocks. These instruments include, SAFEs, KISS and convertible notes. And in this world of the convertible securities, convertible notes are cover something called debt equity. Normally, convertible notes act as the IOU (informal document acknowledging debt). But, instead of cash being paid back, equity is used. Convertible notes also have a unique feature. Normally, investors are only allowed to cash out during a liquidity event, such as when the company is being sold. But the convertible notes are basically debt. And as debt held after the maturity date, the note holder can demand a payback of the total amount owed. The maturity date here is the deadline for a preferred round, and it is only during this round can a convertible note be converted into equity. For instance, let us say that the maturity date is 3 years from the day the investment was made. This means that the company has to have a preferred round before this date. Now that we know what convertible notes are, let us understand how exactly they work. It begins with the investor offering the company funding in the terms of a loan, with a time period of typically one or two years. This term sheet is called the “note.” The convertible note would include the due date of when the balance would become due, along with the interest. The basic idea behind the convertible notes is that the issuing company is on a solid growth path, gathering value for the investor and moving towards entering another investment round. In fact, most noteholders want their note converted into equity at a discount, which will give a higher return than the original debt amount. Why do you need convertible notes and why can’t you directly give equity of your company? Well, this goes back to the introduction of this article where we spoke about valuation and how it is not easy to get. You might not be sure if you have the right value of your company as the company hasn’t reached a stable point in it’s operations. To put it in simple words, you and your investor would not easily agree upon a valuation derived at the initial stage in a company. To be more specific, if you are in your early stage in the company and you are just working on the idea, and need some help with finances, putting a value on your company is practically impossible. During this time, it is normal for the company to not have many tangible items and valuing the intangible ones like intellectual property is still a debate. With the help of a convertible note, you and your investors are allowed to find out the valuation of the company after some time later, when the company has some relevant data like customers, sales, growth numbers and so on. The valuation of a company is not based purely on estimation, and that is why convertible notes are used. The value of the company is determined in the next funding round. So, if you have got an idea and you know your idea is worth all the trouble, you can issue a convertible note to the investor. This would allow you to get money on the table even if the company has just started. An agreement (convertible note) is issued with some terms that would make the investment easier. These terms would be stating the maturity date, interest, and the valuation cap (if any). The money would then convert into equity after a while, before the maturity date. What Kind of Companies Use Convertible Notes? Startups in the high-growth phase are the companies that use convertible notes often. The reason why it is only for the startups is that by the time you reach the Series A round and your company has become more successful, you would not rely on convertible notes. At this moment, your company would have a good value for which you can take up more investment directly. Makes sense? Additionally, since these notes are considered as debt before they are converted into equity, for the convertible notes to have some value for the noteholders, your business would have to grow quickly and get into the next funding round. If you are not able to do this before the maturity date, you would end up paying your debt back with interest. Moving ahead, there are a total of four main features of the convertible notes that you should know about. One thing that you need to know about these terms is that they aren’t required for the deal (except the maturity date). Basically, they are negotiable levers and by having the knowledge of these terms, you would be much more prepared to negotiate in the deal. Another thing that you should know is that convertible notes would have both the discount conversions and the valuation caps. Nevertheless, only one of these terms would be used for the conversion deal. In the end, the most favourable term for the investor during the conversion is the one that would be chosen. This means that if the valuation cap is much more beneficial for the investor instead of the conversion discount, this term would be applied the moment the debt is about to convert to equity. It should also be noted that these terms can cause dilution in the company ownership based on how extreme the terms are. The dilution part of the company would be explained after a few sections. Let us talk about the terms in detail. Maturity date is a date in the future as to when the investor would expect to have their investment converted into shares or have their money paid back. Some of the agreements that are made for convertible notes specify that the notes would automatically convert into shares as soon as they are mature. On the other hand, there are other deals that offer the option to the other party to decide if the investment would be converted or repaid. Most of you are probably familiar with interest rates. For convertible notes, it is a legal requirement to have an interest rate set in the terms. Nevertheless, the interest rate is set to zero in most of the cases. While in some cases it is set to the lowest rate legally required, just to avoid any trouble. As a matter of fact, convertible notes can have higher interest rates, but it is not mandatory. There are two accrual methods of interest rates, simple and compounding. These two methods carry a time frame of how and when the interest rate is calculated. For instance, think about the monthly interest rates that you pay on your mortgage. All the terms related to the interest rates are negotiable, but the interest placed on the debt instrument is usually standard. With this said, you should not accept any high interest rates, but you would also need to take the convertible notes for what they actually are, which is debt. And with debt, you obviously need to pay interest rates. A conversion discount is the negotiation of a lower price of the share when the notes are converted into stock. If you have issued convertible notes to an investor, the debt would convert into equity when the company takes up another financing (next funding round like Series seed, A, B, C, etc.). In short, the investors get “more bang for their buck.” The investor gets the equity of the company at a price lower than the current share price due to the conversion discount. This is because the company would have grown and the value would have increased. An example of this is, let’s say that the company raises money where the value of the shares of the company is $2 per share. And the initial investor had invested $50,000 in the company in exchange of convertible notes that had a 30% conversion discount. If the investor chooses to convert their note, they would get the shares of the company at the rate of $1.4 per share instead of $2 per share. This would mean that the investor would get 35,714 shares for the amount invested in the company. If they waited to participate in the round directly, the investor would have only received 25,000 shares for the $50,000 instead. Hence, it is beneficial for the investors as they get more shares with the company. This last term is the most tricky. Also known as conversion caps, the valuation caps put a limit on the value of the company. And this allows the note to convert at a much higher agree-upon cap. In short, the valuation cap sets a threshold which would make the investor get a larger stake of the company when the convertible notes convert. For instance, in case the investor makes a million dollar investment in the company, and the company later reaches a value of 100 million dollars, the investor would own approximately ~1% of the company. Here the valuation cap has been set high. The convertible note is worth $1 million and the conversion cap that has been set is at $8 million. Now, add the investment of $1 million to the $8 million valuation cap to get the post-money (after investment) value of $9 million. Now, divide the valuation cap by the post-money value. This would give you the percentage that the investor would get in the ownership of the company. In this case, it is approximately 11.2%. Note: For the example, any additional investment that comes in the round in real life has been ignored for simplicity. How Do Convertible Notes Affect Dilution? Each time a company takes up investment, they give out equity in exchange for money and this causes dilution for the current shareholders. The same thing happens for convertible notes. Even though they are converted into equity later on, based on the severity of the terms, dilution would eventually affect it. It is also one reason why you should be careful when making the terms of the notes, or else you would be putting your company and any other shareholder at risk. In short, when the valuation cap is low, the dilution of the ownership would be higher. This because a lower cap gives a lower rate of division. This, in turn, gives a higher percentage of ownership. As per the example, we can see that it turns out to approximately 33% ownership which is a some serious dilution. What If You Don’t Raise a Round Before Your Maturity Date? The noteholder can be generous enough to extend the note. The person might also motivate you to keep going so that you can raise another round soon. But with this, you might have to decrease the discount and lower the valuation cap in the terms. This may be potentially worth it since you would get an extended loan repayment time. The noteholder can make you pay back the loan. And if you are not able to pay it, you may end up closing the business. The note can be turned into equity with a new valuation cap. This is only if you find a common ground that works for the both of you. In this case, you can then convert the convertible notes at a different valuation instead of the one that you originally set. To be clear, not every company should be issuing convertible notes to any investor that comes their way. Also, not every company needs capital or venture capital after the seed round. So, based on what your company actually needs, you should decide if you should issue convertible notes or not. Moreover, if you feel that you want another option other than the convertible notes that can help you in raising funds, then keep reading to know more. In case you still feel that raising venture capital is what you company would need after it gets off the ground, and if you are comfortable to issue equity, there is another alternative instead of using convertible notes. This alternative is called SAFE (Simple Agreement for Future Equity) and the idea of a SAFE is to avoid having a debt, which would be the case when issuing convertible notes. This idea was created by the startup incubator Y Combinator. Since it had 0 debt involved, it is highly flexible and a founder-friendly alternative to convertible notes. Even though the SAFE is the same as a convertible note, it has no maturity date and interest. This means that there isn’t any repayment that the startup would have to make. Moreover, you can also avoid the valuation cap and discount if you negotiate the terms accordingly. But, it is tough to get a deal with an investor who would accept SAFEs due to the high risk involved. Although, promising companies have a higher chance to use these alternatives. Another alternative is KISS (Keep It Simple Security) that works just like any other note. Just that the terms are created as per what the founders and investors want, without any requirements. Due to this, there are two kinds of KISS documents – one that is a bit closer to how convertible notes are and on that is a bit like the SAFEs. Is Your Startup Ready for Convertible Debt? If you feel that all of this is still a bit overwhelming, rest assured that you have other options. You can get loans from a bank or opt for grants. But with a convertible note, you can get the chance to avoid the need to pay any money back to the investor (since you would be paying them with equity, which is better for a longer run). With all the details on convertible notes and your startup ready for success, the next step is to look for an investor who accepts convertible notes. And whatever be the choice (whether or not you would be using convertible notes to raise capital) you would need to track all the shares in your company to avoid any ownership dilution. For this, you would need a cap table application that is reliable and that can be easily managed. This application should be able to help you in keeping track of all your company shares right from the beginning. 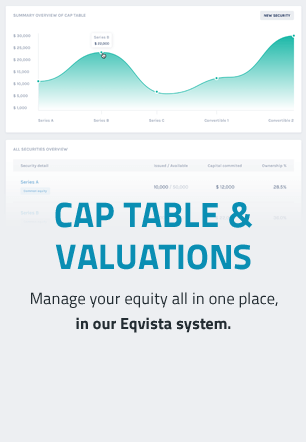 Eqvista is a FREE cap table application that offers just what you need. Check it out here to know more.